photos via Ken Ricketts, source unknown. The above yacht was built in 1955 to a Bert Woollacott design, on a property at the corner of Pukenui Rd & Manukau Rd Epsom & launched in 1955. Ken commented that she looks c42′ long & appears to be a good solid cruising yacht so perhaps ended up off- shore? Ken also suggested the name might be Ghost or Wolf? Can anyone ID the vessel, confirm the builder & any of the people in the photos? This entry was posted in *, Mystery Boat, Sailing Sunday, Yachts and tagged Mystery Boat - Sailing Sunday, Rod Marler, Woody Wagon by Alan Houghton - waitematawoodys.com founder. Bookmark the permalink. 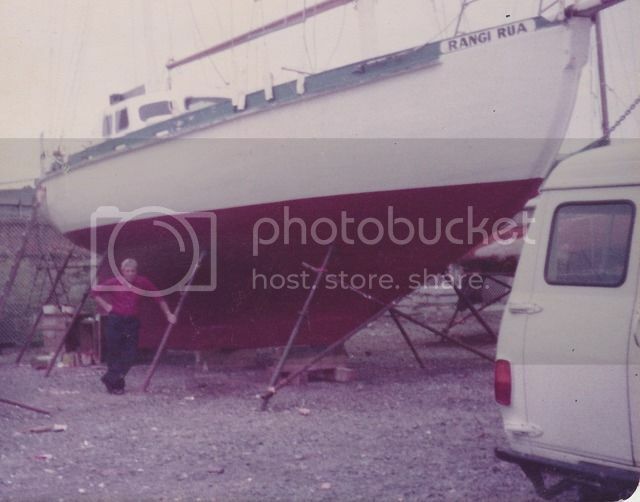 The other possibility if she was 42′-0″ is Rangi Rua, now Spirit of Rangi, owned by Michael Barretts, and launched in 1957, and now at Bayswater.